The current status of radioiodine-131 (RaI) dosimetry for Graves' hyperthyroidism is not clear. Recurrent hyperthyroidism and iatrogenic hypothyroidism are two problems which interact such that trying to solve one leads to exacerbation of the other. Optimized RaI therapy has therefore begun to be defined just in terms of early hypothyroidism (ablative therapy) as physicians have given up on reducing hypothyroidism. Optimized therapy is evaluated both in terms of the greatest separation of cure rate from hypothyroidism rate (non-ablative therapy) or in terms of early hypothyroidism (ablative therapy) by mathematical modeling of outcome after radioiodine and critically discussing the three common methods of RaI dosing for Graves' disease. Cure follows a logarithmic relationship to activity administered or absorbed dose, while hypothyroidism follows a linear relationship. The effect of including or omitting factors in the calculation of the administered I–131 activity such as the measured thyroid uptake and effective half-life of RaI or giving extra compensation for gland size is discussed. Very little benefit can be gained by employing complicated methods of RaI dose selection for non-ablative therapy since the standard activity model shows the best potential for cure and prolonged euthyroidism. For ablative therapy, a standard MBq/g dosing provides the best outcome in terms of cure and early hypothyroidism. Radioiodine-131 (RaI) therapy has been increasingly used for the treatment of hyperthyroid Graves' disease. Many factors contribute to the current popularity of this treatment modality as a primary and secondary management option, especially the recurrence of Graves' disease after drug therapy. Initially, the dosage (radioactivity) administered was worked out by a trial-and-error method but with increasing experience over the last century, RaI treatment methods evolved . Initially, using a standard radioactivity of about 6 MBq (160 μCi) 131–I per gram of estimated thyroid weight, it was apparent that RaI therapy caused iatrogenic hypothyroidism. The incidence was about 20 – 40% in the first year after therapy, increasing by about 2.5% per year to 50 – 80% at 10 years . In an effort to reduce this incidence of late hypothyroidism, Hagen and colleagues reduced the administered quantity of RaI to 3 MBq (80 μCi) per gram of estimated gland weight  resulting in a substantial fall in the incidence of hypothyroidism. However, most of their patients had to be maintained on oral potassium iodide for several months after therapy, in order to ameliorate the thyrotoxicosis that persisted while the radioiodine had its effect[3, 4]. Failure of this low dose therapy was such that about 25% of patients required a second treatment and 5% required a third. It became clear that although this approach reduced early hypothyroidism, it did so at the expense of increased treatment failure and a cost in time, money and patient convenience. Further experience thereafter showed that even if a smaller dose of RaI was given, there would still be progressive development of hypothyroidism with up to 40 – 50% of patients becoming hypothyroid ten years after therapy[5–7]. In an attempt to provide a better separation of cure rates from hypothyroidism rates (non-ablative optimization) efforts were directed at refining the calculation of the RaI dose. Due account was taken of uptake measurements, half-life of the radionuclide in the thyroid, concentration per gram, and so on, but again it became evident that the result in a given instance depended on factors that could not be estimated precisely[8, 9]. Eventually, physicians began to feel that it was futile to attempt to scale down or optimize the RaI dose to a particular patient, and advocated giving up this attempt at reducing hypothyroidism, and just aim for treatment success by administration of a standard dose delivering up to 100 Gy to the thyroid . Physicians argued that since rapid high rates of cure may be obtained with large initial doses of RaI, and that since hypothyroidism is likely to ensue no matter what treatment regimen is employed, the high incidence in this regimen is of no consequence and may even be an advantage, since treatment for hypothyroidism can be started early. This was called ablative optimization whereby a planned complete destruction of the thyroid by RaI treatment was then followed by replacement therapy. It was additionally argued that the near certainty of prompt control and the inevitability of hypothyroidism even with lower doses make this in many respects the optimal approach. Thyroid ablation, as defined above based only on cure rates, has not been adopted universally since many workers in the field do not see this as the optimal approach, but rather as an ablative one, and insist on defining as optimum the protocol in which the administered RaI dosage provides the best possible separation of cure rate from hypothyroidism rate. In this situation, the looming threat of recurrent hyperthyroidism and inevitability of hypothyroidism coexist with the fact that there is no consensus on their definition. Clinicians have expressed frustration with such optimization repeatedly[12, 13], and no consensus has been reached on the definition of this form of therapy. These problems especially with definition and outcome in optimized radioiodine protocols prompted our critical reappraisal of this subject in an effort at clearly defining both forms of optimized RaI therapy for hyperthyroidism. In this article, we examine closely the plethora of data available on the subject and define a mathematical model of radioiodine effect that leads to a renewed definition of optimized RaI regimens in the context of both the highest separation of cure and hypothyroidism rate as well as in terms of thyroid ablation. The methods of RaI dosimetry most closely fitting these models are identified and recommended. Using RaI, the thyroid can be irradiated to very large doses of several thousand grays that induce acute cell destruction (interphase death). However, when doses are smaller, cell death (loss of cells) may be delayed until a mitosis occurs, which is not necessarily the first one[14, 15]. Animal studies utilizing doses comparable to human therapeutic doses, have demonstrated dissociation between the function of the thyroid follicular cells and their reproduction capacity by demonstrating preserved function of the thyroid gland despite an impaired or failing reproduction capacity[16, 17]. The clinical effect of RaI was best demonstrated in the Cooperative Thyrotoxicosis Follow-up Study , where the incidence of hypothyroidism was plotted as a function of RaI dose in MBq/g of thyroid. It was found that about 1% of patients had become hypothyroid at 2 years for each 0.22 MBq/g of RaI administered  indicating a clear relationship between dose and effect. This was also shown by Alevizaki et al who found that the cumulative incidence of hypothyroidism from 6 months to 2 years post-treatment rose almost proportionally to the dose for a dose range of 15–150 Gy. On the other hand, the long term incidence of hypothyroidism was almost independent of the thyroid dose at about 2–4.5% per year for doses ranging between 0.9–7.4 MBq/g of thyroid[18, 20–23]. These observations suggested that the late induction of hypothyroidism is dominated by the rate of cell division, due to mitotic cell death, while the early effect is caused by direct cellular toxicity of radiation. This is in keeping with the observation that when large doses of RaI are administered to euthyroid or thyrotoxic patients with voluminous goiters, the changes in thyroid volume show a sharp fall in the first two to three years and a slower linear rate of fall thereafter . Therefore, the incidence of hypothyroidism at any given time is directly proportional to the magnitude of the initial effect. In other words, if a higher proportion of patients are rendered hypothyroid initially using a particular method of dose selection, then subsequent hypothyroidism proceeds from this point in the remainder with a shorter period to complete hypothyroidism. To assess the outcome of RaI therapy for the achievement of optimum hypothyroidism will then require assessment of first year hypothyroid (FYH) outcomes to the initial dose since subsequent development of hypothyroidism is predictable and independent of dose. A linear hypothyroidism dose model can therefore adequately predict first year hypothyroidism rates. Failure rates should also be defined at one year since the initial dose dependent effect of RaI has been shown to occur in this period and patients still hyperthyroid at this time will need re-treatment. However, in contrast to hypothyroid rates, cure rates tend to plateau out as administered activity or absorbed dose increases. This is because cure is the combination of euthyroidism and hypothyroidism rates and while the latter increases with dose, the former increases and then subsequently decreases as dose is increased. This leads to a lesser and lesser rise in cure rates with the same increment in RaI dose. Studies that have looked at this cure dose response demonstrate that this relationship is logarithmic. In a prospective, randomized multi-center study  dose explained 99% of the variability in cure rates once a logarithmic model was applied (CR = 49.7 LM (Gy) - 182; r2 = 0.99; outcome at 6 months). As the absorbed dose is increased so too does the average activity administered and hence with a fixed administered activity, cure can be expected to follow the same relationship to dose. Again the study of Nordyke and Gilbert demonstrates that for fixed doses of 4–15 mCi (CR = 20.8 ln(MBq) - 36.6; r2 = 0.97; data extrapolated from figure 1 and omitting 3 mCi) the logarithmic model explained 97% of the variability in cure rates. Therefore, a logarithmic cure dose model can adequately predict cure rates. The final model demonstrating the relationship between euthyroid rates at 1 year and failure rates (of treatment) at 1 year at various dose levels for the three methods of dose selection. This relationship is derived from the logarithmic cure-dose and linear hypothyroid-dose models described in the text where: Euthyroid rate = Cure – hypothyroidism rate Failure rate = 100 – cure rate The slanted line demarcates the level below which cure rates are predominantly due to hypothyroidism and vice-versa and serves as the upper limit for non-ablative dosing. The target radiation absorbed dose for effective RaI therapy for hyperthyroid Graves' disease should be at least 60–70 Gy and this is commonly referred to as a conventional dose[26, 27]. Studies using CalA based dose selection were based on the lesser variability found in the value of the effective half time (Teff) in Eq 1. This lesser influence of Teff is because variation in the biologic half-life of RaI in the thyroid, makes only a small difference to its effective half-life. For example, a variation from 20 to 60 days in the biologic half-life would only increase the effective half-life from about 6 to 7 days assuming a physical half-life of 8 days. It has been reported that after abandoning the use of detailed measurements of half-life and substituting it by a fixed half-life of about 5.4 days for example, the mean ratio of actual to predicted doses was 0.98(0.33 SD). Although this may be so in the case of the mean, in Graves' disease, the half-life distribution is skewed to the left and although this means a greater range for a lower Teff, most patients will have a higher Teff than the mean, albeit in a smaller range. Therefore more patients given CalA with the assumption of a constant half-life (of about 5–6 days) are liable to be given a slightly larger activity than with the corresponding AbsD, usually in the region of 30%. The implications of this are discussed later but on the average, if effective half-life is assumed to be about 6 days, a radiation dose of 1 Gy will need the administration of about 0.04 MBq/g of RaI (Eq 2). After adjustment of this administered activity of RaI for the proportion of RaI taken into the gland (uptake), simulation studies reveal that the activity per gram (per gray) required would increase to 0.05–0.07 MBq/g (Eq 2) which is also corroborated by results of clinical studies [2, 32]. Many centers use this method of dose selection that assumes a constant half-life so that approaches to dosage adjustment usually include a factor for gland size, a standard dose in MBq/g (or microCuries per gram), and a correction to account for 131-I uptake. Studies using a FixA method gave fixed activities of RaI irrespective of thyroid mass or Teff. From studies of thyroid size and goitre frequency in hyperthyroidism, it is clear that such patients will show wide variation  and as can be expected therefore, there will be wide variations in individual absorbed doses after a standard activity given to the patients. Studies [2, 26, 32, 35–40] have shown that the average standard radioactivity to deliver a radiation dose of one gray is about 1.5–2.5% of the total target gray dose (less with a higher target gray dose). In order to deliver an average of 55 Gy, a standard radioactivity of 75 MBq is required. However, as expected, there will be a wide range of actual doses delivered, and for a fixed dose of 75 MBq this has been reported  to be 6–98 Gy which is over a 16-fold range. The relationship between cure or hypothyroidism and RaI dose for all three methods was analysed by simple regression using Statgraphics Plus for Windows 3.0, (Statistical Graphics Corp., Englewood Cliffs, N.J.) and applying a logarithmic model for cure rates and a linear model for hypothyroid rates. A visual analysis of the residuals versus dose plot was done to ensure that the pattern was random. A lack of fit test was performed by comparing the variability of the chosen model residuals to the variability between observations at replicate values of the independent variable (administered activity or absorbed dose). This was designed to determine whether the selected model was adequate to describe the observed data. The P-value for lack-of-fit in the analysis of variance was greater or equal to 0.10, for all three methods of dose selection in the cure model suggesting that they were adequate for the observed data. With the hypothyroidism model, there was significant lack of fit at the 90% level for AbsD and FixA, but this was seen also after consideration of ten alternative and more complicated models with better correlation. The linear model was therefore considered most appropriate as it has a clear biological basis previously outlined. The cure rates for CalA are consistent with cure rates at equivalent AbsD assuming that 0.06 MBq/g delivers 1 Gy as previously calculated. However, with FixA a given cure requires administration of less activity than that required with AbsD (on the average 30% lower) for the same cure. The reason for this is that even though the actual RaI activity given to the patient is less, the most common gland sizes are actually getting higher absorbed doses. For example, it has been shown that after a fixed dose of only 75 MBq, (which delivers a low average of 30–40 Gy) there is a 16-fold range of absorbed doses delivered (6–98 Gy) and 20% of patients actually receive doses greater than 60 Gy. This is in keeping with simulation procedures which have shown that fixed activities that would deliver a threshold of 60 Gy are about a third more than the fixed activities that would deliver an average of 60 Gy to the thyroid. When effective RaI half-life is disregarded in the calculation of the RaI activity for treatment on a MBq/g basis, the FYH is higher for the same cure level as compared to the AbsD. The FYH rises from 25 to 95% for doses of 4 to 12 MBq/g respectively, compared to a rise from 15 to 60% after equivalent AbsD of 70 to 200 Gy. This again is explained by the effective half-life differing with a range from 1.6–7.5 days giving a possible difference in AbsD by a factor of 4.6. All those patients whose true effective half-life for 1–131-I is higher than the average are liable to have a higher activity and absorbed dose delivered and if bigger glands are those with increased half-life, this would increase hypothyroidism rates. Conversely euthyroid rates with a FixA are relatively more at every cure level than what is observed after AbsD except for fixed activities of less than 140–150 MBq (see figure 1). CalA or AbsD dosing leads to a very steep rise in activity given with size of the gland, such that smaller glands get a much smaller total activity than larger glands. For example 6 MBq/g would mean 240 MBq for a 40 g gland, 180 MBq for a 30 g gland and only 60 MBq for a 10 g gland. With FixA, the exact opposite occurs, the largest activty per gram going to smaller thyroids and vice versa. To achieve similar cure as FixA with AbsD a much larger dose has to be given to smaller glands thereby increasing hypothyroid rates in the larger glands. This is true at higher dosages mainly and explains why the FixA performs better at doses above 150 MBq or 90 Gy. From the cure model, failure rates are defined as 100-cure%. Similarly from both models, euthyroidism is defined as cure%-hypothyroidism%. The final model is plotted in figure 1 as euthyroidism versus failure rates. The euthyroid rates at one year follow a bi-phasic relationship with dose. As dose is gradually increased, euthyroid rates initially increase, and then following a further increase in dose, fall off again (figure 1). 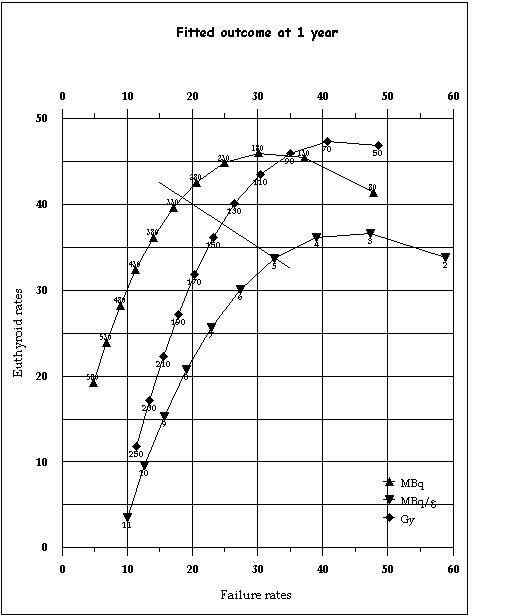 This bi-phasic euthyroid curve is because initially conversion from failure (of treatment) to euthyroidism predominates but later conversion from euthyroidism to hypothyroidism predominates. The turning point for this bi-phasic curve is the break-even point between increasing euthyroidism due to treatment success versus increasing hypothyroidism for the same reason. One useful feature of the euthyroid rates is that they can be used to provide a clinically useful definition of the optimized non-ablative regimens. A lower limit for such regimens would be at the point where euthyroid rates peak (turning point at which the euthyroid rates begin to fall off, see figure 1) as from this point on the separation of cure rates from hypothyroidism rates starts to decline. The upper limit for the optimized doses would be reached when the hypothyroid rates catch up with euthyroid rates (the slanted line in figure 1), as after this hypothyroidism makes up the greater portion of cure. Figure 1 also demonstrates clearly that for optimized non-ablative radioiodine therapy, the choice really lies between AbsD and FixA while CalA is better suited for use in ablative RaI schedules. The dose-range for optimized non-ablative and ablative therapy and the outcome with each method of dose selection is given in table 1. The data is based on a combination of both models described in the text and depicted in figure 1. Minimum and maximum doses apply only to nonablative regimens. The minimum dose is at peak euthyroid rates. The maximum dose is where hypothyroid rates have caught up to euthyroid rates (making up half of the cure rates). The non-ablative cure range is 60–80% and the FixA gives superior results for cure > 70%. The current status of RaI treatment regimens for Graves' hyperthyroidism suffer from inevitable induction of hypothyroidism and the risk of recurrence of thyrotoxicosis. Optimization of RaI treatment regimens aims at selection of the administered radioactivity that gives the highest cure and lowest euthyroid rate (ablative) or the former with a maximum euthyroidism (non-ablative). The way to achieve the latter has been addressed making use of available reports in the literature and a critical appraisal of the patterns of cure and induction of hypothyroidism. It is clear that for all three methods of dose selection, the euthyroid rates initially rise as the dose increases and then falls off as hypothyroidism ensues. The best outcome in terms of separation of cure rates from hypothyroidism rates is for a FixA between 185–310 MBq. The maximum euthyroid rates possible are about 40–45% and cure between 70–80%. Assuming a cumulative hypothyroid rate of 3% per year, the median time to hypothyroidism (for those euthyroid at 1 year) would be about 7 years. This is achieved at the expense of one patient out of every five treated needing re-treatment with radioiodine. On the other hand, if only preventing re-treatment is considered optimal, clearly any method of dosing could be used and similar cure can be achieved by administering 11 MBq/g as CalA or 250 Gy as AbsD or 500 MBq as FixA. However, if in addition to high cure, early hypothyroidism is also required (ablative treatment), the only suitable method is through administration of a CalA, as at 11 MBq/g less that 5% of patients will be euthyroid at one year, compared to 10% given 250 Gy and 20% given 555 Mbq. From the model, a dose of 11–12 MBq/g predicts a 90% hypothyroidism rate at one year. For any further improvement in these non-ablative optimized regimens, what is required is some modification that increases cure while at the same time blunting the rise in hypothyroidism. This method came to attention when it was noticed that doses estimated to deliver an AbsD or CalA to the thyroid (after linear adjustment for size) still resulted in higher hypothyroid rates in those patients with smaller goiters, and lower rates with increasing size of the goiter [35, 38] as well as a significant rise in the percentage of patients still hyperthyroid with increasing gland mass [10, 47]. Several workers have since used extra (non-linear) compensation for the size of the thyroid, by giving an increasing CalA (range 1.5 – 3.7 MBq/g) individualized to thyroid size (lower CalA for smaller glands and vice versa). [23, 65, 66] These regimens which resulted in a mean dose of 1.9 MBq/g have resulted in cure rates in the range 66–76% at around one year which is about double the cure rates expected for this average dose. Hypothyroid rates however remain the same both with these as well as the non-compensated regimens of similar average dose levels and are about 10% at one year [23, 65, 66]. This increase in cure rates without a rise in hypothyroid rates obviously means that failure rates are decreased and this is in direct contrast to the effect of RaI given in a similar but non-compensated dose of 1.85 MBq (50 μCi) retained at 24 hrs per gram of thyroid tissue  or 35 Gy resulting in a similar (4.3–7.1%) incidence of hypothyroidism but only a cure rate of 30.7–46% at one year. Recent evidence also confirms that larger goiters need more than just a proportional increase in dose to increase cure. As the evidence in favor of such extra non-linear compensation per gram of thyroid became clear, it also became evident that it is not the activity of RaI per gram deposited in the thyroid that determines the outcome in a particular gland, but rather the total activity actually deposited. This is evident from the fact that smaller glands require more activity per gram than larger glands since CalA dosing leads to a steep rise in hypothyroidism rates with increasing dose (see fig 2). What would probably work more efficiently in this instance is to start off with a small FixA then step it up in multiples of a FixA so that the total dose increases with gland mass. One way to do this is to start with a small dose of 185 MBq and then step it up in multiples of 74 MBq with increasing gland size. Since (as described above) the relation between cure and activity/gram is non-linear, the fixed extra compensation will result in a greater than proportional step-up in administered activity. Trials of such graded FixA [48, 68, 69] using palpational estimates of gland sizes, do indeed suggest a better outcome. In our study , we graded the thyroid clinically as grade O,I, II & III based on a modification of the WHO endorsed goitre grading system [70, 71] where the common clinically detectable goiters were grouped into grade 0 or I depending on whether they were not palpable/just palpable (grade 0) or mildly enlarged and visible with the neck in a raised position (grade I) representing the two commonest groups seen in Graves' disease. The remaining goiters were then either classed as a large goitre visible easily without neck extension (grade II) or a monstrous goitre, (grade III). A dose strategy of 185, 259, 370 and 444 MBq respectively was given to patients who mostly had Graves' disease (see table 2). This simple compensated fixed activity regimen resulted in 85% cure at one year. The hypothyroid rate was below 10% at one year even though the mean activity administered was about 296 MBq. Without graded dosing, the expected hypothyroid rates with this FixA is about 40% at 1 year, while with CalA or AbsD that result in the former hypothyroid rate, euthyroidism would be quite poor. In another study, after grading the thyroid clinically as small (<30 g), medium (30–60 g) and large (>60 g), cure was 61% at one year with a 17% hypothyroid rate. The dose used was 185 MBq, 370 MBq & 555 MBq respectively for the three clinical grades with a median dose of 370 MBq (range 185–555). Again this meant a decrease in the hypothyroid rates from about 50% for non-compensated 370 MBq treatment to 17% for similar but compensated therapy. This last group of workers also demonstrated that a calculated activity of 3.7 MBq/g, delivering approximately 60–70 Gy, resulted in the same FYH (17%) but a worse cure (48% Versus 61%). Other workers  using compensated fixed activities have reported that after a mean activity of 296 MBq (148 MBq for impalpable glands, 185 or 222 MBq for minimally enlarged glands and gradually increasing doses to 555 MBq for a large nodular gland), the FYH is only 10%. Although all these studies use palpational estimates of gland size, a more accurate grading is not expected to improve upon outcome because radiation dosimetry uses approximations[13, 73, 74], and it can not be expected that the dosage delivered by means of precise gland size assessment will be more accurate than those delivered using just an estimate. Adapted from the data of Zaini et al 1992 . Only palpation was used to decide dosing in this study. The assumption made is that grades I - II goiters have median weights of 20–40 g , with the grade 0 goiter having a median weight of about 8 g [76,77] and grade III goiters a median weight of 80–100 g.  This regimen needs to be formally evaluated, especially in a study that uses a more accurate method of thyroid size assessment. It is clear that if the target of RaI therapy is a prolonged period of euthyroidism, the increased effort and expenditure involved in calculating the precise activity of RaI for a target radiation absorbed dose, do not improve upon a FixA and in fact result in worse outcomes. It would seem that a return to a simple regimen utilizing FixA is inevitable for such a goal. Grading such FixA can be expected to markedly improve on the euthyroid rates (but not on overall cure rates) and in final assessment, the regimen in table 2 is suggested. This regimen requires prospective confirmation. Apart from the expected 20% re-treatment rates at one year (which is the minimum possible), it is also expected that such RaI therapy will not result in a very rapid restoration of the euthyroid state. Therefore short-term administration of anti-thyroid drug therapy[23, 68] may need to be recommenced a week after such optimized, non-ablative RaI therapy for a period of three to six months. Further, the progressive rise in the incidence of hypothyroidism with the passage of time remains a complication since the risk that thyroid failure develops continues for life. Due to the fact that many of the symptoms of hypothyroidism may be attributed to aging, physicians following these patients need to be vigilant to ensure that such mix up does not occur as that could lead to a delay in diagnosis, as well as to subsequently supervise, at least till thyroid failure, all of these patients.